For time-jumps like this, Matt sends out texts to get a vague idea of what everyone’s planning on doing, but they always come up with more/different stuff at the last minute. Beau mostly enjoyed her training with the halfling monk. Marisha: “I don’t know if he was her flavor.” Matt: “That can be taken a few ways.” Marisha thinks it’s important to learn from multiple teachers, and that philosophy bled through to Beau in-character. If a player’s plans fall through because of the dice, Matt may try to give them a partial win anyway if it looks like a player will be genuinely disappointed and lose out on having fun, but he points out that this group is generally very accepting of the possibility of failure. Marisha is really excited about the extra reactions Beau gets now. She also loves the visual of Beau being super amped to go kick a** and then having to just rage-read. The cast loves the Mighty Nine, but they still really miss Vox Machina. Marisha is enjoying how new fans of the second campaign are reacting to Keyleth when they go back to watch the first campaign. Matt points out how great it is that this group is comfortable sitting back and allowing or facilitating chances for growth and development from the other characters, because that results in slow but realistic growth of the ensemble (rather than backstory dumping right off the bat). The Waste Hunter Blade is permanently gone now that Fjord’s consumed it; the falchion shape is the constant in this process. Matt thought this was a good way to fit with the Hexblade class while still allowing for the upgrading of weapons throughout the campaign. Dani points out that at some point he’ll probably have to let go of his last memento of Molly. Ouch. Beau was a little bit worried about Fjord leaving, but fundamentally it was something she would’ve done as well. In this party, they’re still pretty used to people coming and going and taking care of their own business. Matt tends to keep a few DC thresholds in mind for library excursions, with different levels of information prepared according to how well characters roll. He now has to overprepare (and often improvise) even more than usual as a reaction to Caleb’s character. 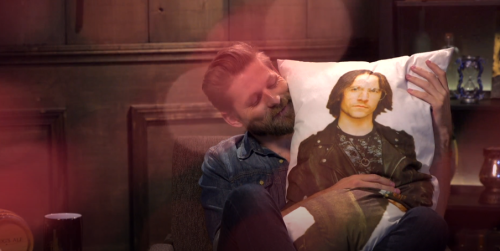 “I’m so excited they’re engaged in that regard.” He’s had a lot of campaigns in the past where people were completely uninterested in lore, so he’s happy to play to that, and he wants to reward Liam for playing that kind of character properly. Gif of the week: ghost-punching. Beau’s goals have changed since meeting the Mighty Nein. Marisha is more aware of meta-goals than Beau is directly. “Keyleth was deeply long-term goal-oriented. Deeply. I didn’t want to do that again.” Beau’s flying by the seat of her pants as a big-fish-in-a-small-pond character getting thrown into something much bigger. Beau’s leveling montage was mainly just a fun bit of narrative-based flavor—she won’t have to return to the Archive every time she wants to level up, but it’s a great opportunity Matt wants to take whenever possible. Matt sings an 80s-style montage for training to punch ghosts. It’s glorious. Fanart of the week: Fjord underwater. Matt had only loosely outlined the Gentleman as part of the underworld faction in Zadash; he only became an important character because of that one time Beau stole the mail. Especially when she was younger, Beau was definitely the sort of person who would leap unnecessarily into violence just for the excitement. While she’s a little more cautious now, sometimes that enthusiasm still slips out. Matt especially enjoyed Jester’s shenanigans because it was a great example of players not playing it safe. He points out that painting a symbol of Bahamut in colors that could be interpreted as belonging to Tiamat would’ve been… bad. The government would’ve gotten involved if they’d been caught. Beau opening up more to calling the rest of the group friends/family is partly because the rest of the party’s started doing it as well, which kind of gives her permission to admit it (to herself and the rest). “Beau’s never had friends that lasted this long.” Brian: “Friendships that lasted this long, or they all died like Molly?” Ouch. Matt: “Just for perspective, by ‘friendships that lasted this long’, she means ‘two and a half months.’” Also ouch. Marisha: “All of Beau’s friends were people who worked in the criminal underground who were older than her and just passing through the town.” She was the local hire for people passing through. Matt is loving building Jester’s relationship with the Traveler. He talks about how he designed Exandria as a world where the gods have basically removed themselves from mortal concerns. This has been an opportunity to explore the notion of different scales of deity (Vesh was a similar example from the previous campaign). He talks about how the Traveler can have a much more personal relationship with his followers because he’s not constrained by the Divine Gate. Matt and Marisha love Caduceus because they enjoy seeing Taliesin’s quick wit paying out with longer payoffs. What flavor of dead-person tea would they be? Marisha: weed and red wine. Brian: bourbon and resentment. Matt: ahi tuna. Matt loves DMing CR, but he also loves backing off to give other members of the cast a chance to shine in the DM chair.